The Scotland of the East, as they had once named it, is a treasure trove of nature’s wonders. 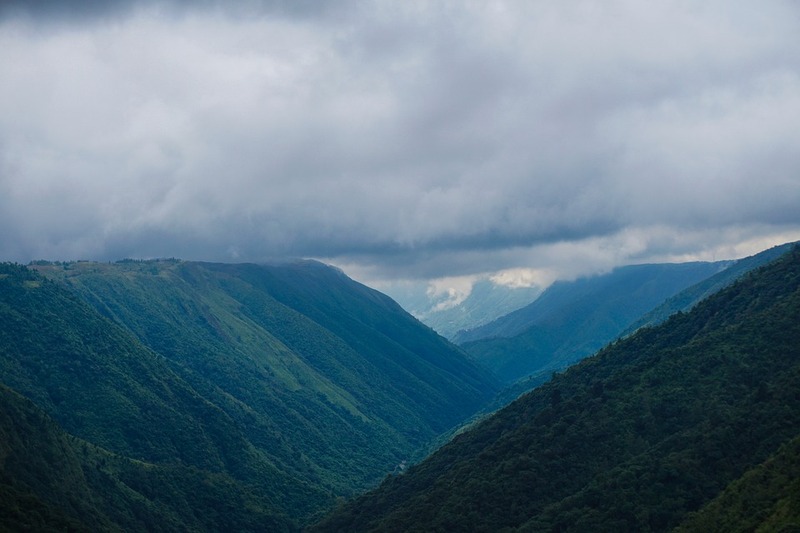 The capital city of Meghalaya serves as the gateway to the mystical hills and valleys of the Northeast. With lush green hills, silvery waterfalls, and sparkling rivers, Shillong offers the most magnificent views that you can find. But the highlight of Meghalaya’s landscape and its pride lies in Cherrapunjee, also locally known as Sohra. Popular as the wettest place on earth, this town, receives the highest rainfall and thrives on nearly 70-80% humidity (with an average of 45%) in the rainy season. If you are in Meghalaya, then a trip to Cherrapunjee is a must. After all, it’s not every day that you can find yourself drenched in mist, without so much as a drop of rain. Sitting on the East Khasi Hills of southern Meghalaya, Cherrapunjee is roughly 54 Km from Shillong city. You can plan for a road trip from Shillong to Sohra and extend it to Mawlynnong and then Dawki. From Shillong, it takes nearly two-three hours to reach your destination. If you are traveling from Guwahati, you can book a cab from Guwahati to Cherrapunjee and take the Guwahati-Shillong-Nogkrem- Sohra route. It is always better and safer to rent a car for a comfortable and hassle-free journey, especially if you are new in this part of the country. Also, since you will be treading hilly terrain and unknown routes, it is better to avail of popular car rental services with experienced drivers who are well-versed with the road. Savaari’s Outstation cabs are premium quality but extremely affordable and come with vehicle options that can ply the rough mountain roads. Also, when you leave the driving part to the experts, you can sit back and enjoy the ride and absorb the beauties of nature that this scenic route offers. A major part of Meghalaya’s road system is great for traveling, except for in places where the mountains close in and the road narrows. Despite being at a higher altitude, there are no steep curves or zigzag roads, which makes the drive more enjoyable. Irrespective of which season you are traveling in, you will find it much cooler in Cherrapunjee than in Guwahati or Shillong. The best time to travel, however, is in the summer months, when you can enjoy the misty air and the cooler mountains, which are a far cry from the summer heat of the plains. The route from Shillong to Cherrapunjee is arguably the most scenic one for a road trip in India. And if you are lucky to find the right weather, then it would the perfect icing on the cake! As you cross the city limits of Shillong you will find yourself driving through the clouds, across the undulating roads. While one side of the roads are lined with thick forests of pine and other evergreen trees, the other edges into deep gorges. The crisp air and the cool, wet weather will make you feel refreshed inside out! Roll down the windows and let the fog come in and brush your face and even before you realize, it will disappear. The viewpoint at Laitkor Peak: This point offers breathtaking views of the Shillong city, from its airbase. You might need to seek prior permission and present your identification documents. Formalities aside, this point is a popular spot for photography. The Elephant Falls: A few miles ahead of the Laitkor Peak, take a small detour to reach the Elephant Falls. It should take another 30-40 minutes to reach. For a complete experience, climb all the way down to the pool for a closer view. If you can spare more time, then spend some time at the base and take a walk around. Get your pick-me-up from the local Khasi Kongs with a hot cup of freshly made tea. Mawkdok Valley: This would be your last major stop on your way to Cherrapunjee. The rolling hills and the lush valleys with their gorgeous views, definitely call for a visit. There is a flight of stairs that leads to the valleys below, all the way to a small waterfall that cascades down a plateau. As you cross the Mawkdok Bridge, you will start experiencing the magic of Cherrapunjee, starting with the dense fog, with reduced visibility. This makes for another reason to hire a car and not drive yourself. Cutting through the misty roads, you will reach the Seven Sisters Falls or the Mawsmai Falls that welcome you to Cherrapunjee. And thus, from one gem of Meghalaya to another, make your trip to Cherrapunjee a journey to remember!